Distractions are a big problem. Just about everyday a new article comes out about the dangers of crossing the street while distracted, yet people continue to do it. 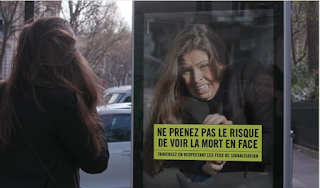 To get the point across in a more impactful way, the Road Safety Authority France launched a new experiential campaign targeting people not paying attention. A billboard equipped with motion-detecting sensors was set up at a crosswalk. Any time a pedestrian crossed against the light, the billboard made terrifying tire screeching noises to frighten the pedestrian into thinking they might be hit by a car. The billboard then went a step further to capture the horrified expressions on pedestrians' faces the moment they thought could be their last, with a message to pay attention and not risk their lives. This is a campaign anyone can get behind--promoting safety and possibly saving someone's life at the same time. Yes, it may have been a bit horrifying for pedestrians, but sometimes the most impactful experiences are the most disruptive and uncomfortable ones.